Our entertainment center covers this whole wall in the familyroom across from the sofa and has two bookcases on each side of the center section that holds the tv. 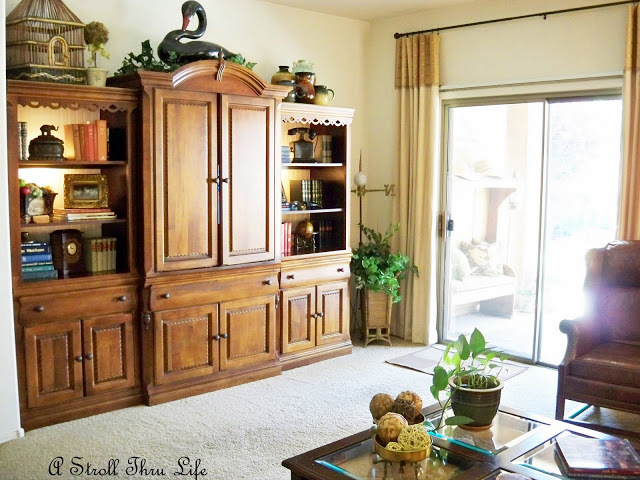 I really enjoy this piece, it gives me tons of storage for all that necessary equipment, but it also holds my serving trays, chargers, napkins and napkin rings and is super handy since it is next to the kitchen as part of our familyroom/kitchen open floorplan. I have these fabulous shelves to play with, but sometimes I just forget to change them up. I don't think I've changed them up since before Christmas. This is what the left side has most recently looked like. Now it sports this new look. See my wonderful new M that I found. I have been enjoying all the little greenery pots that I have been making, (you can see my tutorial here) so I sprinkled some of them around on these shelves. 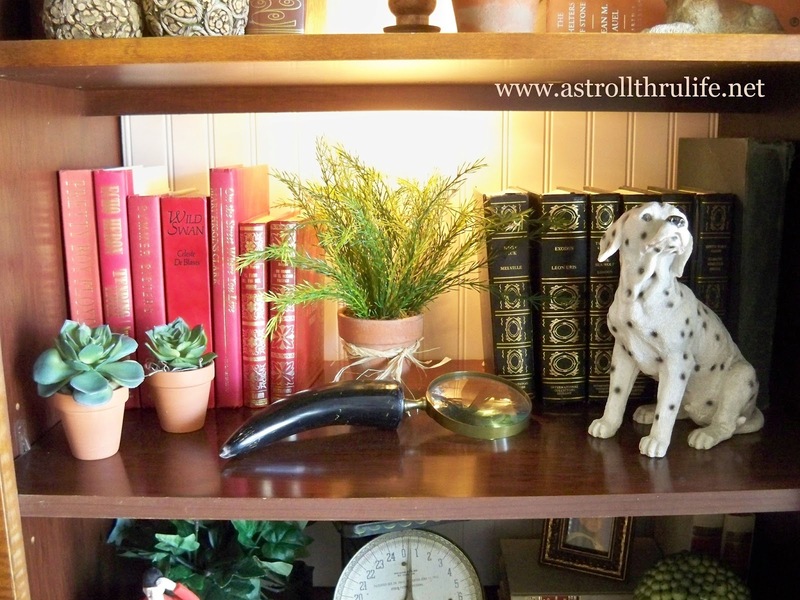 See my little topiary on the top shelf and the feathery fern in the middle, aren't they fun!!!! This was what the right side looked like. Way too long since it was changed. This is it's new look. I removed some of the books and opened it up a little more. I like that better and all my new greenery looks fabulous on this side too. I put the two succulent pots on the top shelf, another fern in the middle and my orb on the bottom. I need to make more of these, there are so many places they can be used. 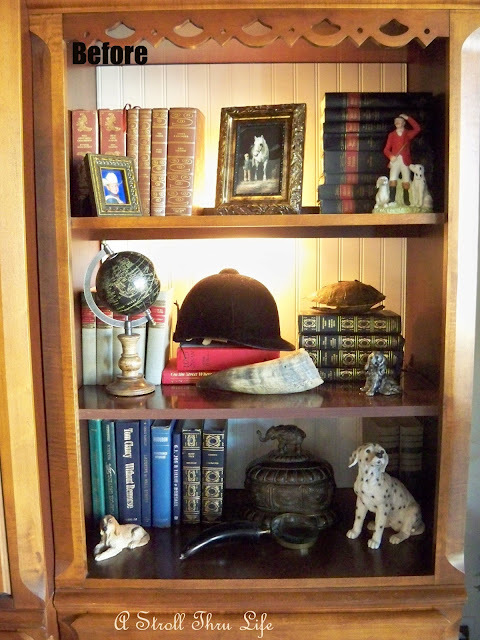 Sitting on the sofa looking across, the bookcase vignettes tie in with the coffee table now. Nice to have something new to look at. 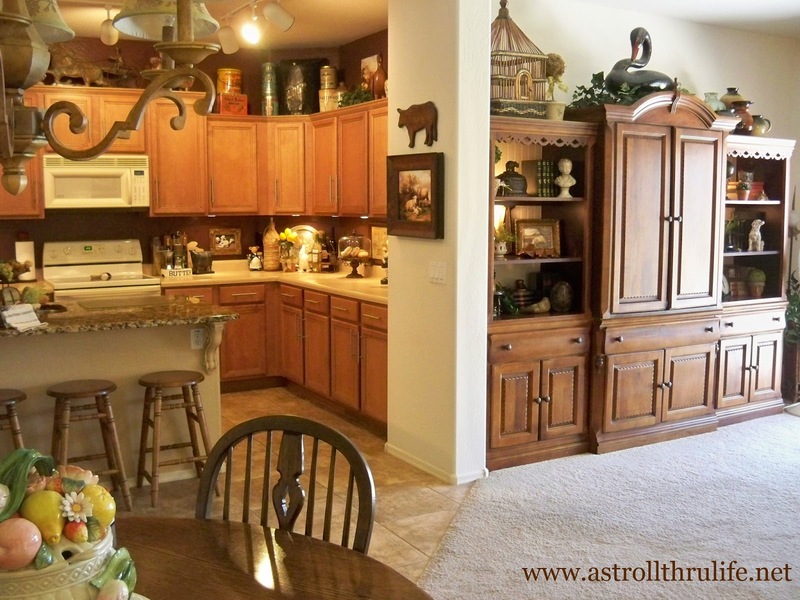 So how about you, are there some areas of your home that don't get changed up all that often? Styling shelving can definitely be challenging. You did a great job! I love all the vignettes you have on each shelf Marty, very classy and elegant. I think the common base element for all these are you beautiful old books! Love it, have a lovely day and hugs back to you Marty! Marty, you have flair. Love the re-arrangement. The M is special...Spring time is a perfect time to change things up. 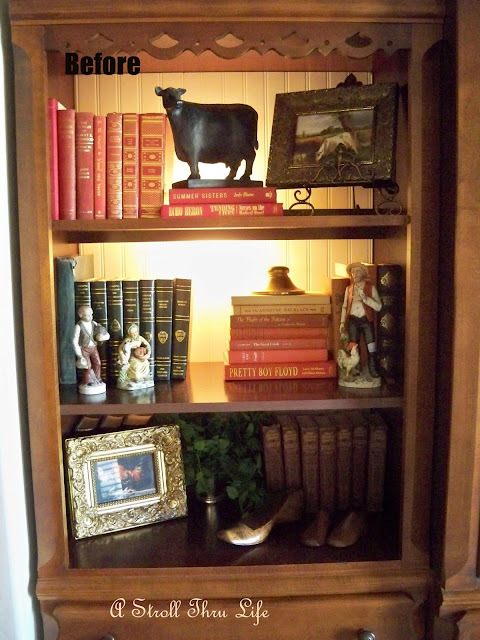 Love what you have done with the bookshelves. Pretty updates. Yes, my shelves do need to be changed up. Even more so, I need for YOU Marty to come do it for me lol! You certainly the eye for it! It all looks so fresh and lovely! I actually have a few of the same books and one of the globes. I'm very drawn to your style here, Marty. I'll tuck this away in my memory for when I redo my shelves soon. Thanks for the inspiration! Your bookcases look really nice, Marty. They looked good before, but change is always good! My bookcases keep on changing constantly with all the stuff my kids and the hubs leave on them :) They don't listen. I love how you've styled them up Marty!! You have such great accessories. What a beautiful piece of furniture. The lights are a nice touch too! Great job! Marty what a beautiful cabinet! 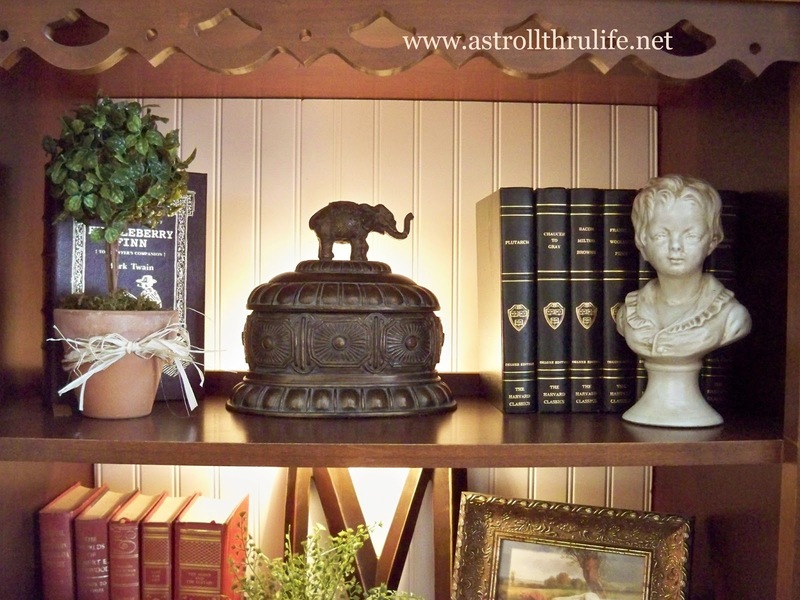 The before looked great but I do love the after!Love your new vignette! Very, very nice-amazing how these updates change the entire "feel," of a room. Your updates reflect the Season so beautifully! 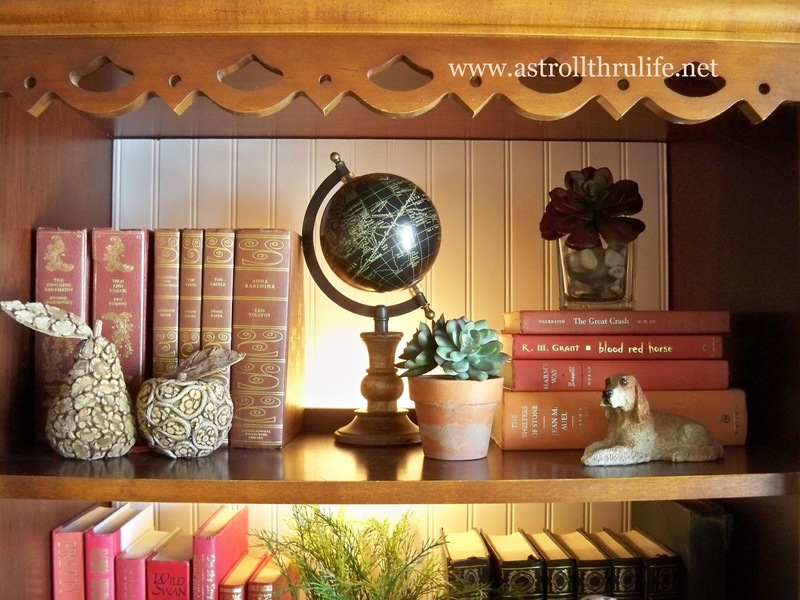 I need you to come by and help me style my bookcases. I truly a so so bad at this. I just can't seem to get it right. 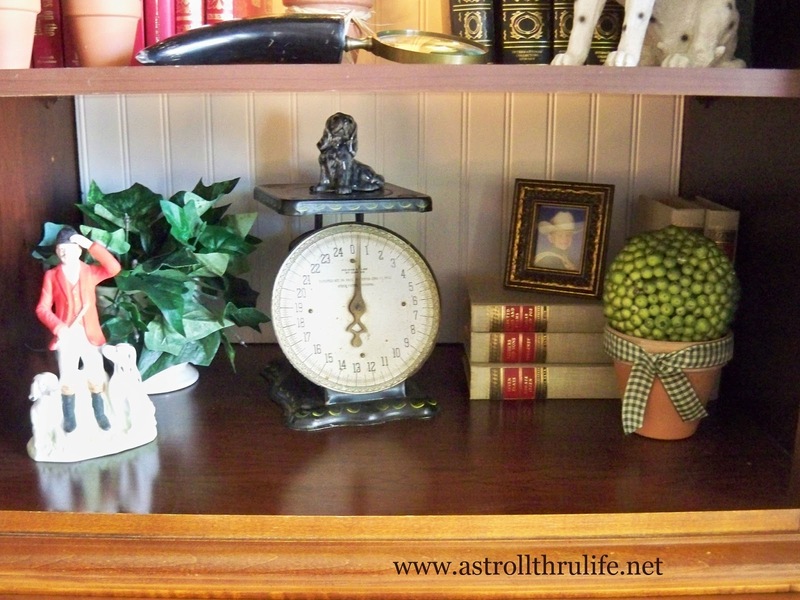 I love how you group your books and have mini vignettes in front of them. Wonderful post. I can certainly learn from your styling! Hi Marty! 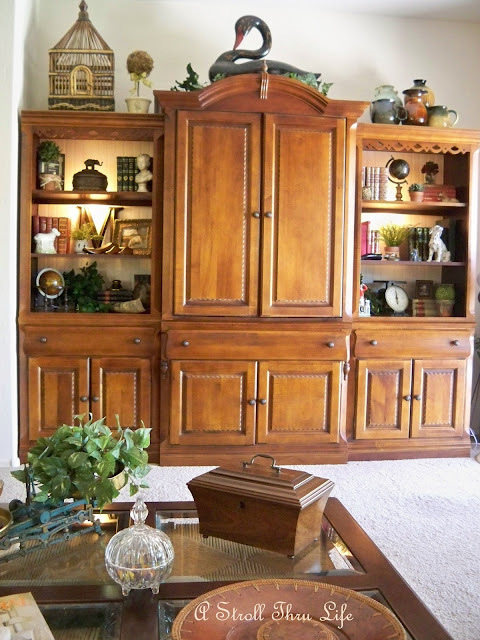 Your entertainment center is just gorgeous. We need a new one..perhaps one of these days. They really do make a room! Love your little pots of greenery ! 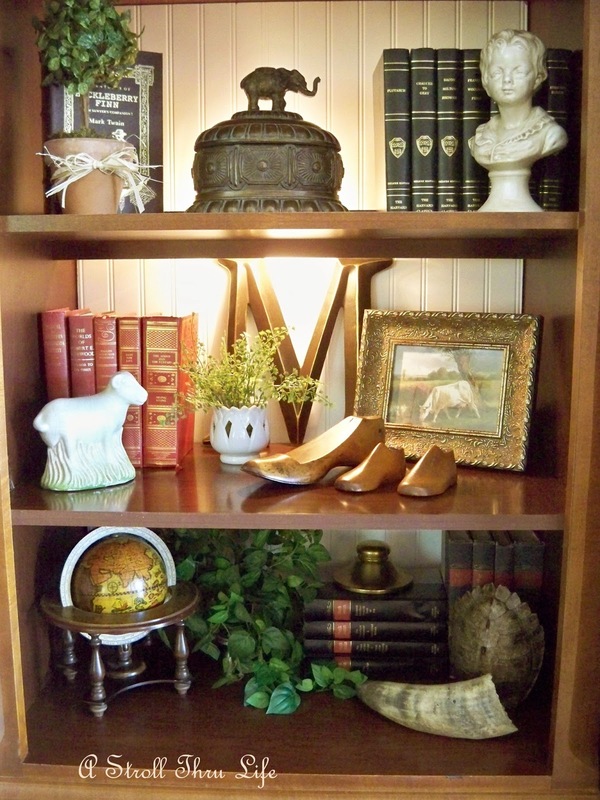 Your shelves look great ! Amazing changes. Love the "M". I use letters and quotes freqently in redesigns. Thanks for sharing. Wonderful job, Marty! I love the little picture of the cow...fits in perfectly! Gorgeous styling! And I have a little brass doggie, too. Thanks for the great ideas! 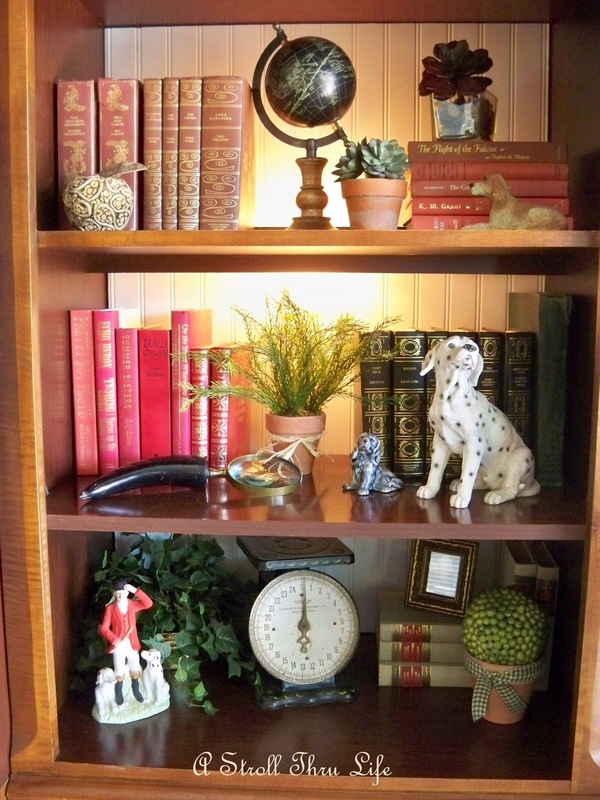 Your shelves look very nice! I love your big M! 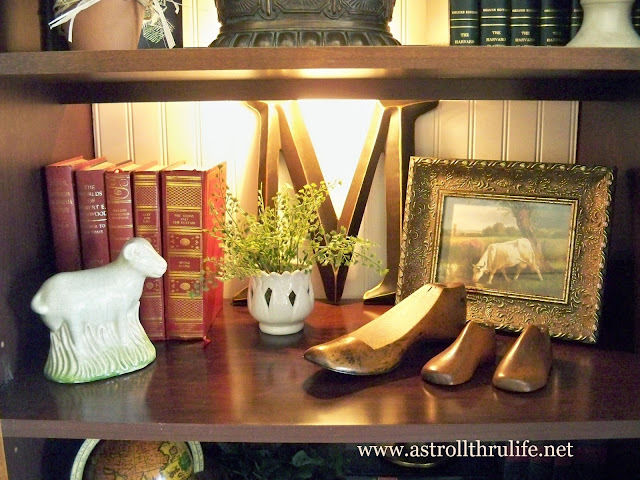 Marty, you always have the best styling ideas and vignettes! 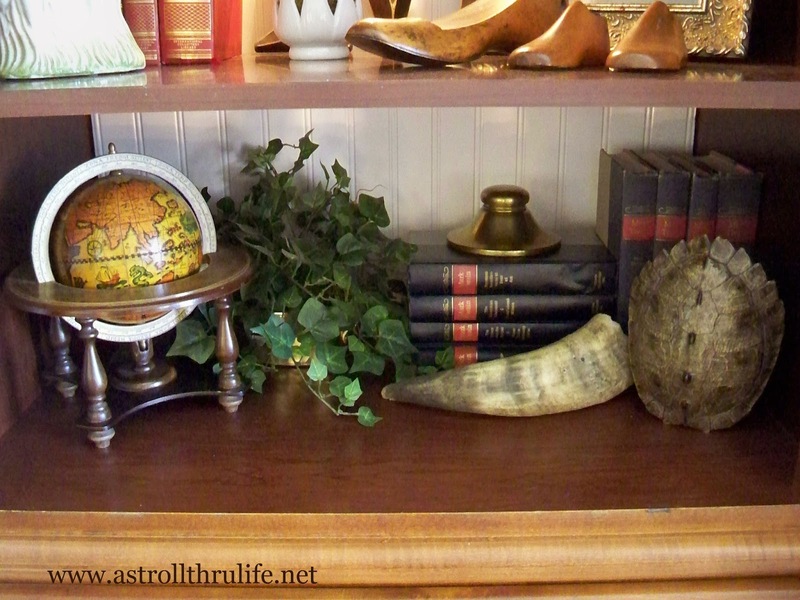 I love the greenery in your cabinet! The "M" looks fabulous. You have made me take a good look at my cabinets! I haven't touched them in a long time! Thanks for the inspiration! It's fun to change things up every now and then. Really nice job! Lovely! I love the way you re-work and re-do! I get kinda tired of my stuff too. you'll always be the "Queen of Vignettes" in the Land of Blog, dear friend!